A bit of background. Back in late March, early April, I took a class on how to make kumihimo braids and incorporate beads with Annie Dilker of Moss Hollow Pottery. 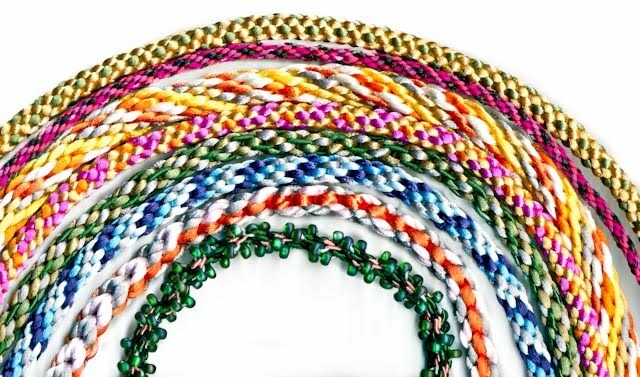 (I was interested in Kumihimo because I thought it would be a good craft to travel with - not that I really knew anything about it, but I'd seem some pieces made for a class at Beads n Stitches, and I was intrigued.) 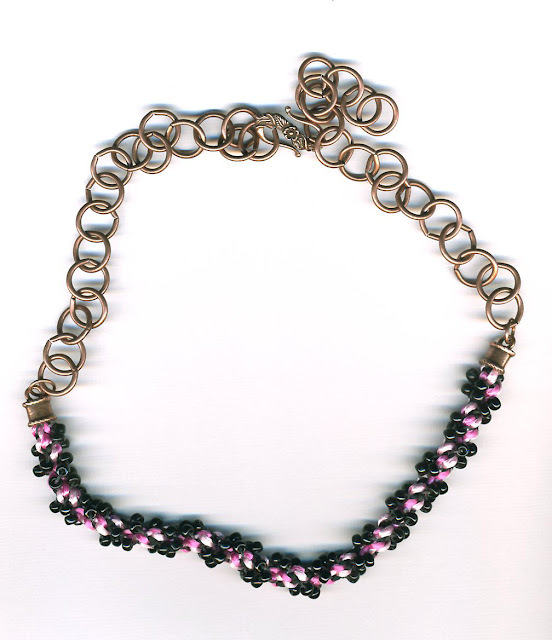 The class was given during an Innovative Bead Expo show, which I had only gone to because my PMC class was cancelled. I had been thinking about learning the technique for a while - and when I heard a woman behind me on the line to get into the show ask about the class, I chimed in that I'd like to take it too. It turned out that there were no students signed up for it, but the teacher would be willing to give the class anyway. Unlike other some teachers I'd taking beading classes from, Annie didn't bark at her students, she didn't act like she was the Queen of the May deigning to teach something. She didn't play favorites. Better yet, her instructions weren't full of errors, missing pages, steps or written backwards. * Simply put, Annie was a great teacher - patient and dynamic. She didn't info dump, rather she would have us pause our work and she'd relay some information. I walked away from the class excited and eager to learn more. When I got home that evening (the show was in Tarrytown), I spent hours on line trying to learn more about my new skill, and (equally important) where to find braiding materials. In class, we used satin rattail for the non-bead warps, and SuperLon for the bead warps, and while I bought a range of colors in the SuperLon from Annie, I figured I'd have no trouble getting the rattail. Turns out that finding rattail in quantity, cheap, isn't easy. The rayon cord is better than the polyester, but it more expensive and is much harder to find. I also discovered Jacqui Carey's site, and learned about the traditional method and materials for kumihimo - the marudai (the loom and stand), tama (weighted bobbins), and the loose multistrand "ropes" made from silk or rayon (in my eyes, the braids made with these materials are much more interesting that the rattail braids). I ended up purchasing a whole range of colors of the polyester rattail from a seller on eBay (Dollites) , a bunch of larger ez-bobs from Primative Originals, the self-covering bobbins favored by the modern kumihimo braider, and a few books. During the class, I realized that I have a lot of potential braiding materials - loads of gimp (wrapped satin cord used in upholstery), as well as skein upon skein of DMC embroidery floss. I also had a few huge spools of Japanese knitting ribbon in various shades of pink and purple. I tried braiding with the gimp, but the foam kumihimo loom was too rough on it, and the wrapping began to decay. The embroidery floss was just too fine, and didn't work will with the extremely heavy SuperLon. The ribbon faired better - in combination with the SuperLon, it created a lovely, strong and narrow braid. I got in my order of rattail, and began braiding like crazy. I swiftly became bored with the simply one-over-one basic 8-warp braid, and tried out a few others. After a while, my interest waned. I was not successful in translating the marudai based instructions to the slotted loom, and the rattail was really beginning to bore me. I wasn't incorporating beads, and while I did enjoy the results of the braid, I soon realised that had no idea what to do with the product of my labors. It was time to start thinking about the beads again. *Can you tell that I'm talking about someone in particular?